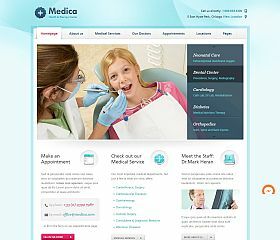 Medica was designed for the medical and dental field, clean and professional-looking it is able to accommodate all of the various sections you might need for your dental site. Responsive and Retina-ready, it looks great on any device, and includes: a featured content slider, bookings/appointment calendar, built-in page templates, and areas for information that is most important to your patients (contact information, location, etc.). 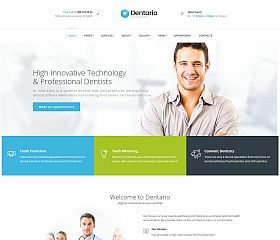 Dentic is a professional, premium, and responsive WordPress theme for dentists or those in the dental field. Display information about your business or practice with the included sections and features. Share information about your team/staff, display testimonials, highlight your services and products, and promote the things most important to your clinic with the built-in featured content slider/carousel. 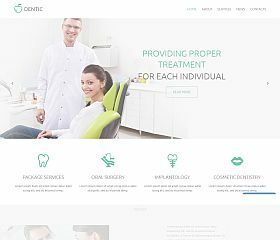 Dental Clinic is a responsive WordPress theme for dentists and professionals, with a modern and professional look. Incorporating parallax design elements, a full-width slider, section for displaying services, office hours, phone number, and more – you can be up and running in minutes with a great-looking site for your practice or business. 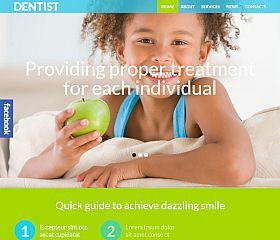 Dentistry delivers a beautiful design that will project a professional image for your practice, clinic, or business. Revamped and re-launched, this theme provides a beautiful way to share your content, posts, and news. Multiple customization options give you the ability to create a site and layout that is truly unique and includes features like valid coding, SEO-optimized, and much more. 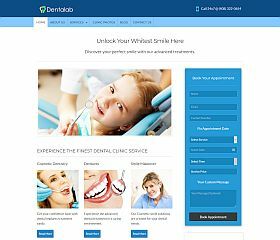 Dentalab is a responsive theme for dentists that allows you to show all of the most important information to your visitors. A built-in appointment-booking form, services section, social media integration, and a custom dashboard for modifying various elements of your site are just a few of the things you will find included in this theme. 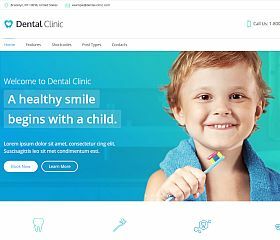 Dental Clinic is a multipurpose theme built for dental clinics and dentists, yet is flexible enough to work for anyone in the healthcare industry. Features include: integration with WooCommerce, built-in shortcodes, premium content/image sliders included, optimized for SEO, retina-ready, custom post types included, animation effects, multiple page templates to choose from, unlimited colors and schemes to choose from, and more. 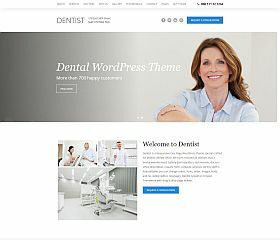 Dent-All is a modern theme for WordPress that was created specifically for those in the dental field – whether you’re a dental office, clinic, specialist, or provide general dentistry services. The theme comes with dozens of options: built-in scheduling/appointment-booking, list your services and prices, theme options panel, 4 unique skins/sstyles to choose from, responsive layout with Bootstrap, parallax design elements, Google Fonts integration, and many other extras. 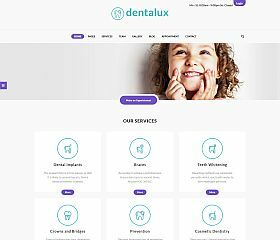 Dentalux was designed for those in the dental field – offering dentists, clinics, and others to have a great-looking (and functioning) website that easily conveys the message and information you want to provide. Dozens of features are included in the theme: dozens of custom features, built-in shortcodes, $100+ worth of premium WordPress plugins included (including built-in appointment-booking), responsive layout and design, optimized for speed and performance, and much more. Dentist provides the perfect design for those wanting to share their business information in an easy-to-read and concise format. This single-page theme packs everything you need into one stunning design – from hours of operation and location information to staff profiles and services offered as well as: “before” and “after” sliding photo gallery, Retina-ready, theme options, unlimited color schemes, shortcode generator, and has been optimized for search engines. 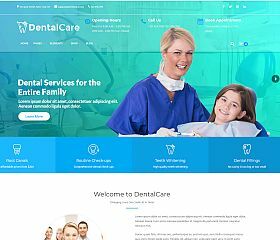 Dental Care is a theme built for the dental field – whether you’re setting up website for a dentist, endodontist, hygienist, orthodontist, or any other type of clinic or dental practice. Built upon the popular Bootstrap foundation, it offers a beautiful and responsive design that looks great across all screen sizes and comes with extra features like: online appointment booking, theme options dashboard, WooCommerce support, and dozens of other features to give you a site that is both beautiful and highly functional. 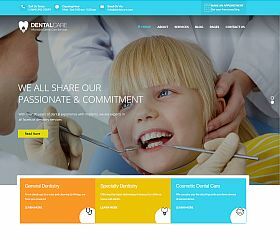 Dentalcare is a WordPress theme that gives you a cutting-edge design for your WordPress site in the dentistry field. 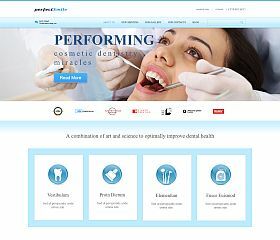 Fully responsive and Retina-ready, it features: built-in appointment booking, drag-and-drop layout functionality, shortcodes included, theme options panel, and the design and functionality is versatile enough to work for any type of medical site (even those outside the dental field). 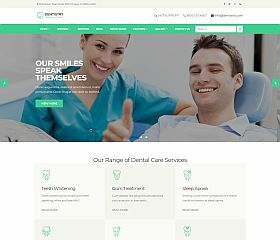 Dentistry is a modern and elegant theme for the dental industry, packed with features and aesthetic touches that are sure to make your site look and function exactly to suit your needs. Features: responsive layout, appointment booking and scheduling, “before” and “after” gallery, parallax design elements, boxed and full-width layout options, slider gallery, theme options panel for customizing your site, shortcodes, and many other enhancements that give you complete control over the look and feel of your site. 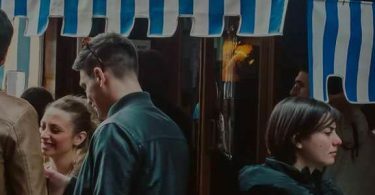 Dentario is equipped with all of the features and functionality you might need to attract customers (like prominent contact and location information, Google Maps integration, online booking, and more) – it has been designed to help you build your business. 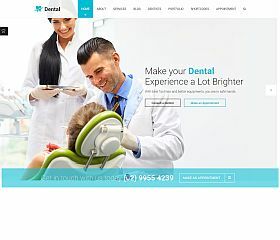 Medent will give you a modern look for your dental business, incorporating eye-catching design elements like animation effects, hundreds of fonts to choose from, a responsive layout that adapts to nearly any size screen, parallax background elements, and features that will help you book more business. 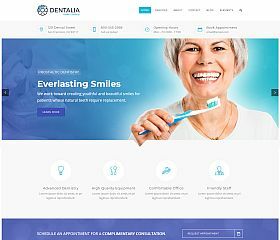 Dentalia gives you a beautiful-looking site for your dental clinic or business, one that includes all of the information and things that matter most – this theme has been optimized to generate business. The responsive layout, before/after photo gallery function (great for showing customer results), and the rest of the features that are included will give you a site with state-of-the-art looks and functionality. 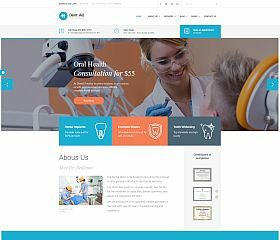 Dental Health is a powerful and modern WordPress theme for practices and business in the dental field. 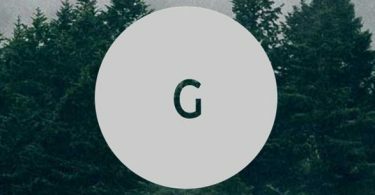 It comes packed with beautiful shortcodes, multiple layout/post options, a built-in appointment/booking form, portfolio, and dozens of other features and options that can be customized. 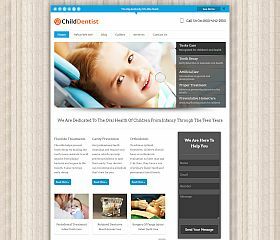 ChildDentist was built to serve dental specialists in the pediatric field (although it would work just as well for any other type of business or practice). It includes features and functionality that allow you to set up a useful and easy-to-navigate website that looks professional, clean, and modern. Whether you’re a dentist, dental clinic, periodontist, hygienist, orthodontist, or have a business that specializes in the industry – you want to convey trust, professionalism, and a welcoming environment. A clean and uncluttered site helps reinforce your visitors’ and clients perception, which is why you will find many of the themes in this roundup maintain a very crisp and uncluttered design. 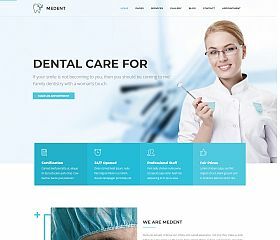 While many of the medical WordPress themes would certainly work for those in the dental field, the ones in this collection have been specifically designed to cater to the field. So, whether you’re wanting a simple site to book appointments, share your office information, or cater to a more niche audience (like cosmetic work or specialty surgery) – these themes should provide what you’re looking for.